So I’ve moved back to Australia and I needed an internet connection. I settled on the ISP Aussie Broadband (ABB). But I didn’t know how much data I needed!! “All of it!” is the normal answer, but not fiscally responsible. So I needed to keep track of data usage. However, ABB doesn’t have a mobile app or even an API to query. I does have a web portal you can log into and view your usage. But this become tiresome after a while, and missed a bit of data I needed; How much data do I need to get through to the next billing cycle. So, it was time to flex some PowerShell muscles. So firstly I needed a nice way to show the usage. I remember seeing a PowerShell module to draw graphs in the console; and sure enough Prateek Singh wrote PSConsoleGraph. Unfortunately this hasn’t been posted as a module on the gallery yet (HINT HINT) so I just cloned the source. Then it was just a case of firing up Chrome Developer tools and watching the HTTPS traffic flow. 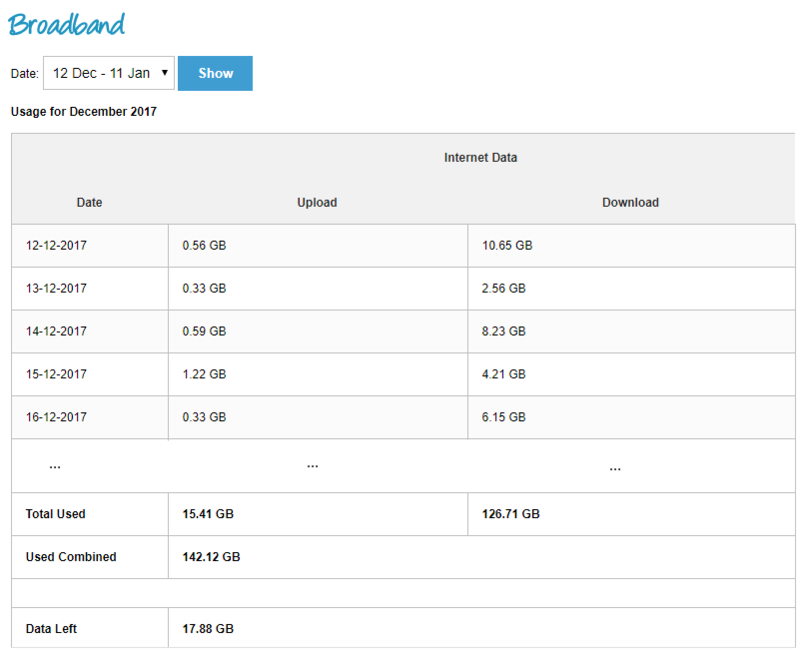 It seems the first call to the usage page (https://my.aussiebroadband.com.au/usage.php) expects a login form with username and password and returns a session cookie. And then the next call to the usage page, with a valid session cookie, returns the data we need. 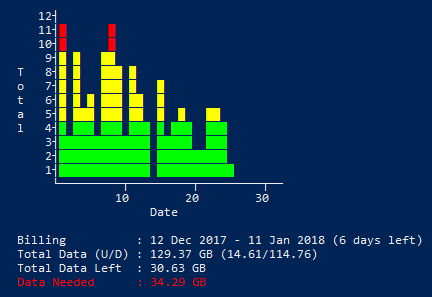 A little bit of PowerShell and tada I have my usage statistics! So we now have the HTML page but how do we extract the data? So we just need to find the relevant table and search through all of the table data (TD) elements. In particular I needed to find the table that has a header with the text ‘Internet Data’. As PowerShell has access to the HTML DOM, this was trivial to do! One thing that was annoying. Every now and then the DOM parsing would just fail with weird error codes. After a bit of searching I found this article https://www.sepago.com/blog/2016/05/03/powershell-exception-0x800a01b6-while-using-getelementsbytagname-getelementsbyname. Turns out I need to use the fully qualified method name IHTMLDocument3_getElementsByTagName and then everything was happy!! That gave me prior usage but was still short of what I wanted. A little more web scripting and I figured out the total usage for the billing cycle and how much data I had left. I also figured out the dates of the billing cycle. We then calculate the projected data I need, by multiplying the average Data per hour by the total number of hours in the billing cycle; and then subtract the data already consumed. I was happy with what I had so far but if I wanted to share this script, I couldn’t hardcode usernames and passwords. So I turned to the PSSecret module by Kiran Reddy. I then created a new script Invoke-MyAussieBroadbandusage.ps1 which managages loading and saving credentials. So now you could either supply the username and password as parameters to Get-MyAussieBroadbandUsage.ps1 or use the Invoke script to handle this as well. After an hour or so I could query my broadband usage via a single command in PowerShell! Pretty nice. Feel to try it out yourself with the Source Code. The Invoke-MyAussieBroadbandusage script will load saved credentials if none were passed, otherwise the Username and Password parameters will take precedence. By default credentials will not saved. The script will then run the Get-MyAussieBroadbandUsage.ps1 script with the supplied credentials. Invoke-MyAussieBroadbandusage can be thought of as a credential wrapper around the Get-MyAussieBroadbandUsage script. The first time the script is called we save the credentials and the second time we call the script we no longer have to pass username or password.